Here it is! After a few months of owning it and about a month of use (long story), I’ve finally got around to reviewing the physically biggest purchase I’ve made to date, the Obutto R3volution! Is this the desktop revolution we’ve been waiting for? Fig1. – The Obutto R3volution. 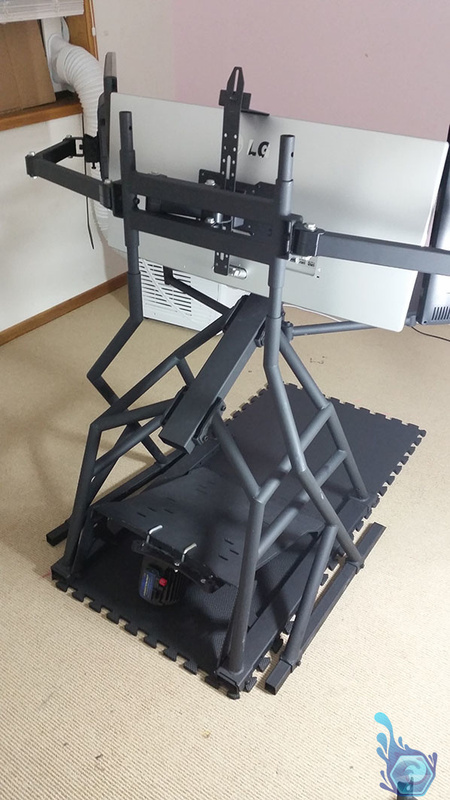 Firstly considering that the Obutto is very useful as a simulation cockpit for driving and flight games I’ll be also reviewing the Buttkickers compatibility alongside it as they go hand in hand and provide an epic 4D vibrating experience. I also decided to finish this review (finally) when Linus, from LinusTechTips on YouTube showed a teaser of his upcoming review of the R3volution, primarily to give others some more content for perusal and understanding someone else’s opinion who also purchased the cockpit mainly for desktop and gaming use but also for simulation. Also please excuse the pictures, I own a light box but not one big enough for the obutto so you may see some clutter in a few of the pictures. Fig2. – My Obutto completely set up. So why would I buy an Obutto Revolution? Fig3. – Part way through building the unit. Now why would you buy something like this you may ask, when there’s perfectly good desks at furniture shops? Well because you can’t exactly mount a massive Buttkicker tactile transducer to one of those flimsy office chairs, and if you did it would probably make it lopsided and fall over when you stood up not to mention that the vibration would literally move the chair across the room if you weren’t sitting on it during bassy movies. But that’s not even a real reason in my book because a lot of the people who buy an Obutto won’t be purchasing Buttkickers for it, one good reason is because desks are becoming somewhat outdated for gamers and aren’t comfortable after hours and hours of playing, this is where the Obutto comes in. The ability to recline the chair and watch Tv, movies or even grab a remote control for those action games is paramount, setting a new standard of comfort for those long hours at home catching up on some of your favourite shows. Fig4. – A side view of the unit partially set up. Another reason why I bought the Obutto was to mix things up from the boring and traditional desks that plague workplaces and businesses, why sit at something at home when it simply feels like you’re back at work on the computer? You could even fall asleep in the chair if you wanted, which I actually tried for a week just to write about it, but overall it wasn’t that comfortable due to wanting to lay on a different side but couldn’t due to the chair bolsters coming out from the sides and hugging you preventing much movement. I loved that fact that the chair can pretty much go horizontal though which gives you a similar feeling to a bed, but bring your own pillow as the headrest can get uncomfortable over time. Fig5. 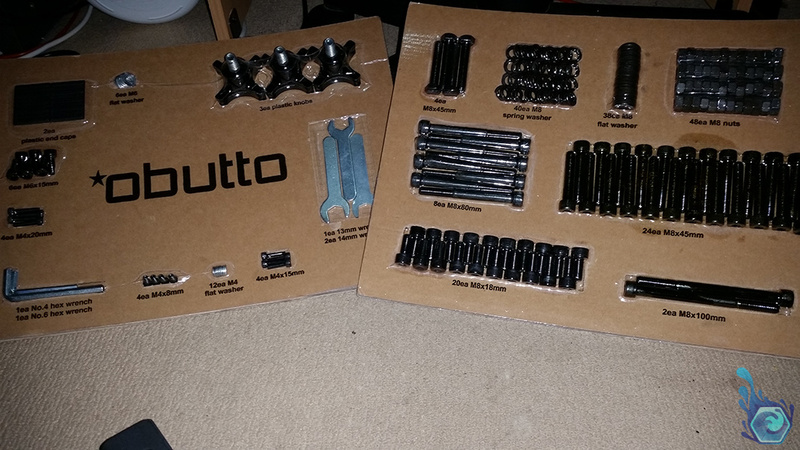 – The pretty nicely packaged tools and bolts. Fig6. 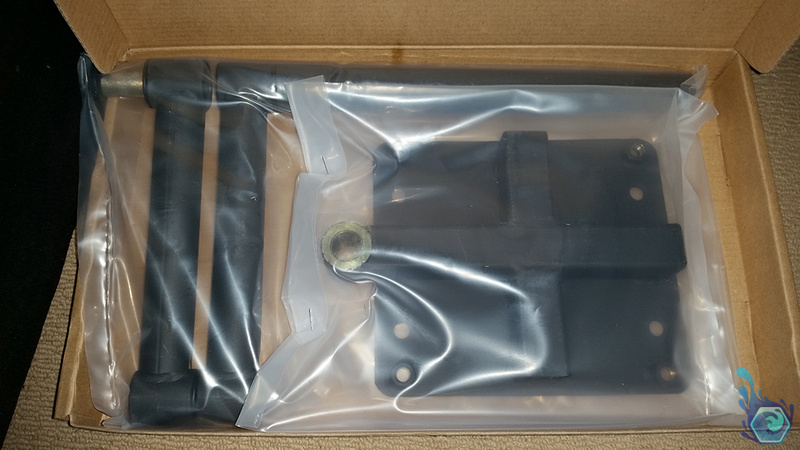 – The packaging for most of the metal components. Fig7. 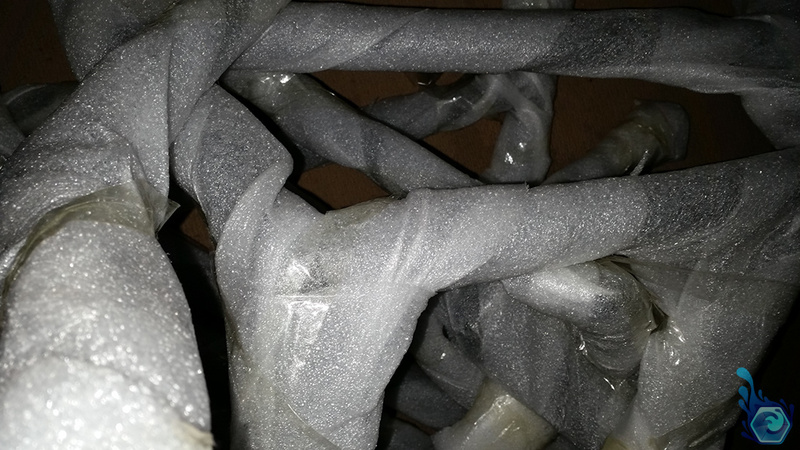 – The foam protection on each of the metal parts. Fig8. 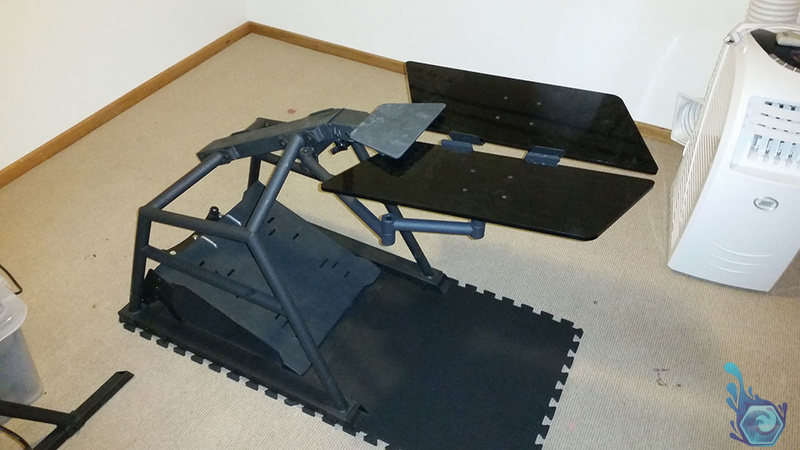 – The chair frame without the chair. Fig9. 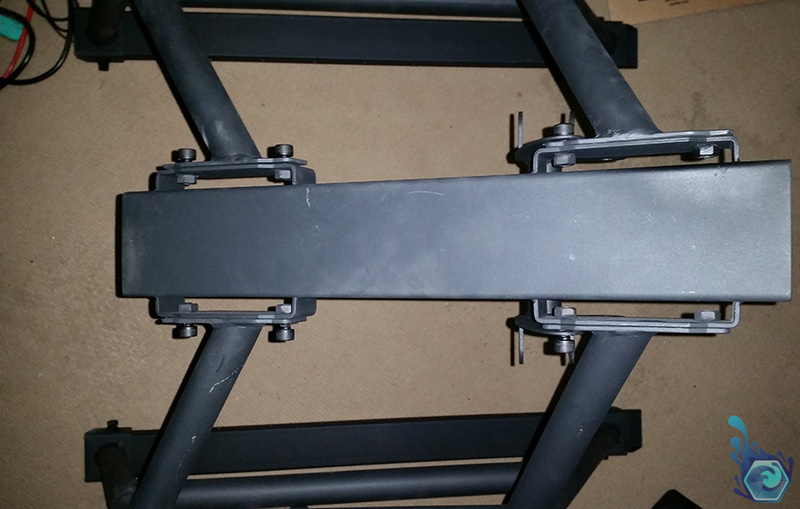 – The footrest joint on the main frame. The metal frame of the Obutto is a very nice powder coated dark grey metal that has a very smooth feel to it and it’s marvellously strong. The color gives it a nice subtle look which blends with most backgrounds and I could hardly imagine it any other color as it would either stand out too much or be too dark. 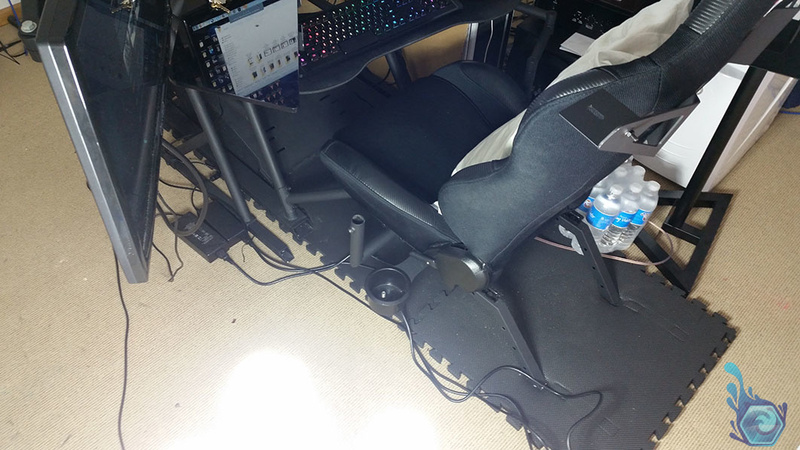 I received a lot of remarks on how strange this contraption looks which functions both as a desk and a simulation/gaming battle-station which pretty time consuming and difficult to put together. The written instructions were confusing at times but I found the online video tutorials to be extremely helpful assembly tools and I had it built within about 5 hours. The Obutto as a whole is a very sturdy ‘desk’ which weighs over 100kg’s and takes a few geeks to carry the largest box of pieces when you receive it in the mail (or two strong guys). I basically had to open it after it was delivered and carry each part to my room from there as there was no chance of moving that thing after it was delivered. Fig11. 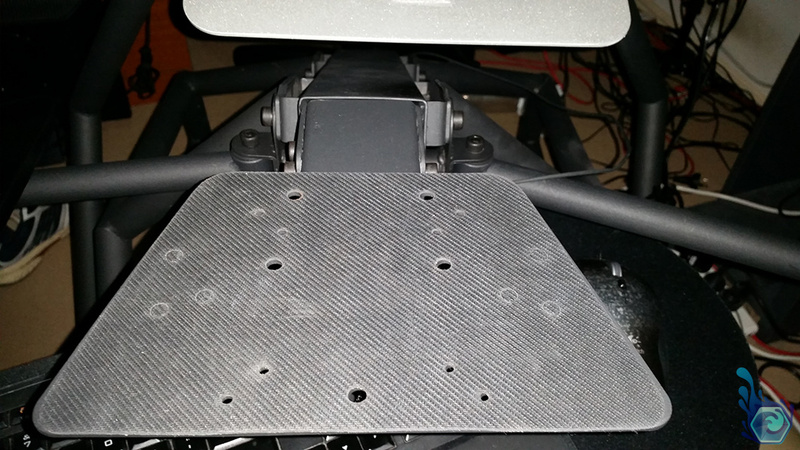 – The top of the main chassis, don’t forget to leave the bolts loose at this stage. Fig12. – The speaker add-on attached to the chair and monitors. Fig13. – My complete obutto set up in the new room. Fig14. 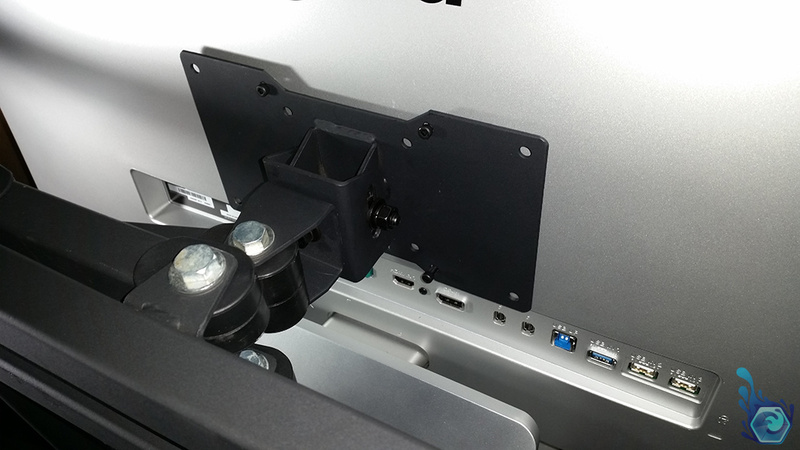 – My 34UM95 mounted by VESA to the center monitor arm. 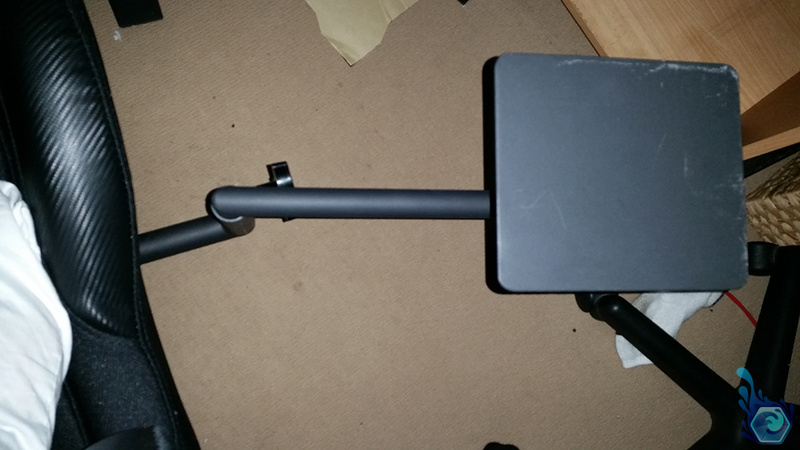 I didn’t feel that the monitor stand was very strong structurally, most notably with the triple display mount and considering the sheer amount of weight it’s got to carry three screens, it would honestly fall over forwards with a slight push to the back. 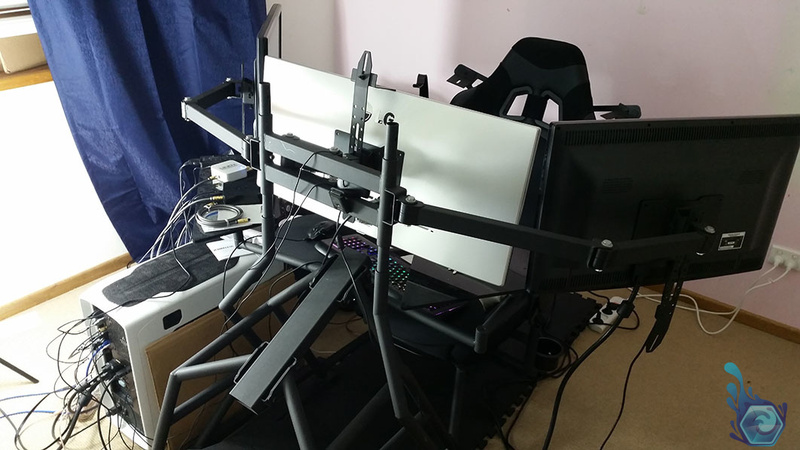 The worst thing is that it almost did tip over once while I was adjusting the third monitor on the stand once, the entire structure started to move forwards and I had to catch it to prevent catastrophic damage to my two $700 and one $1300 screen. 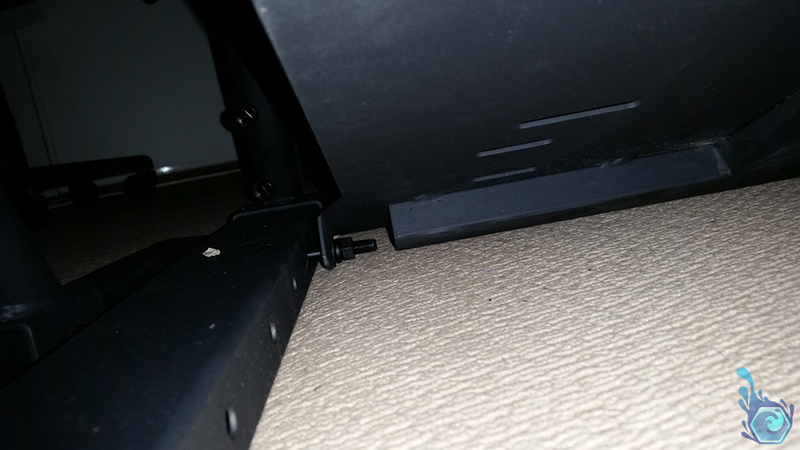 I removed the extra long screws from the foot pedal and attached them to the spare holes on the base of the main structure over top of the monitor stand to try to prevent it from falling forwards again which would surely break at least two of the screens. Once you’ve got everything set up however there appears to be minimal change of it falling over if you’ve positioned it correctly. 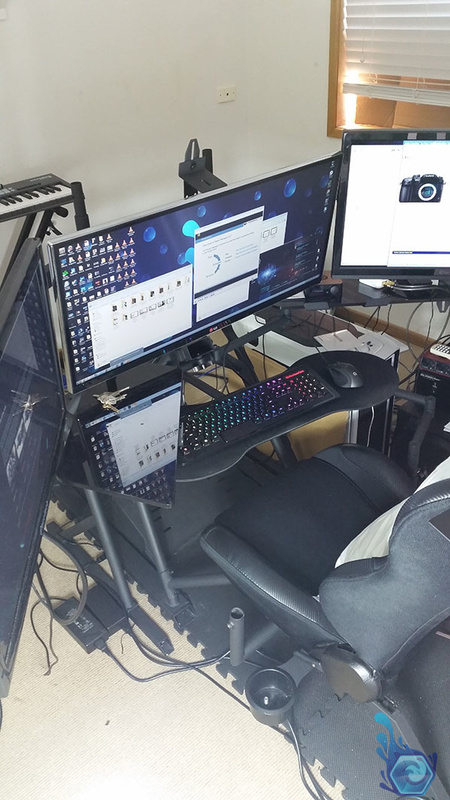 You may notice that my monitors aren’t quite aligned with each other which is mostly due to my completely different sized monitors and it would look much better with 3 of the same type as well as allowing eyefinity. 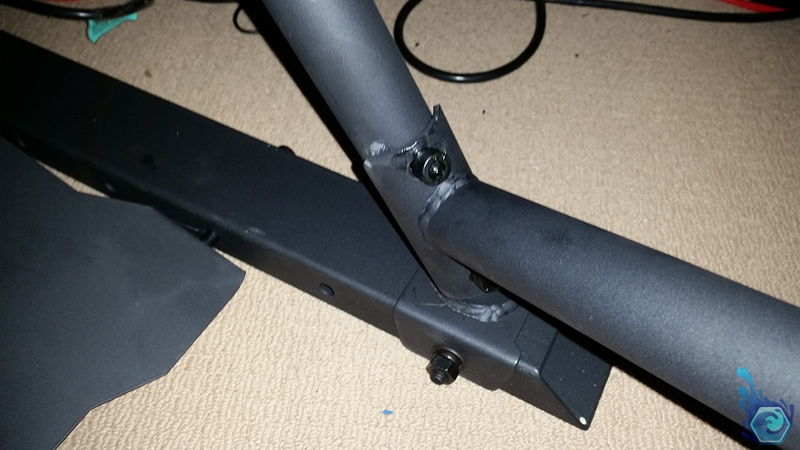 I would have liked it better if the stand was actually designed to attach to the main frame to prevent this from happening as there are surely enough screw holes available to make attaching it easy, all you would need is some holes in the monitor stand’s base to line it up. One other strong feeling I had about the stand was that there needed to be more holes for additional heights of the monitors, three is adequate but some in-between and others that allowed lower heights would have been an improvement because I like the looking at monitors with a slight downwards tilt to my head. My ideal eye-line level would be in the upper 3/4’s of the monitor but it’s currently in the lower 1/4’s and that’s with the chair in a typical car seat position. Fig15. – I use a ‘yoga’ pad under my obutto to prevent floor marks due to it’s weight and to increase vibrations with my buttkickers. 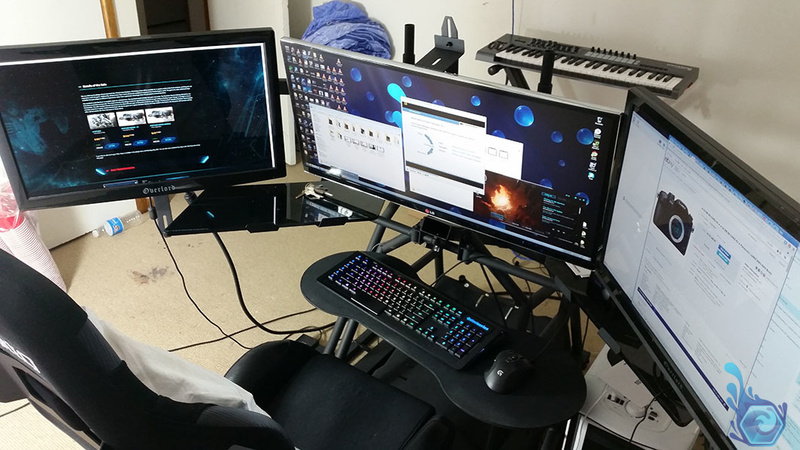 I rather liked that fact that the monitor stand supported three 30″ monitors or my setup which was one 34″ and two 27″ monitors, this felt like one of the best setups I’ve had when sitting in this monster of a command centre. Movies on the 34″ 34UM95 look fantastic as there’s no black bars and the seat and side monitors make this feel like a cinema experience, just add popcorn! 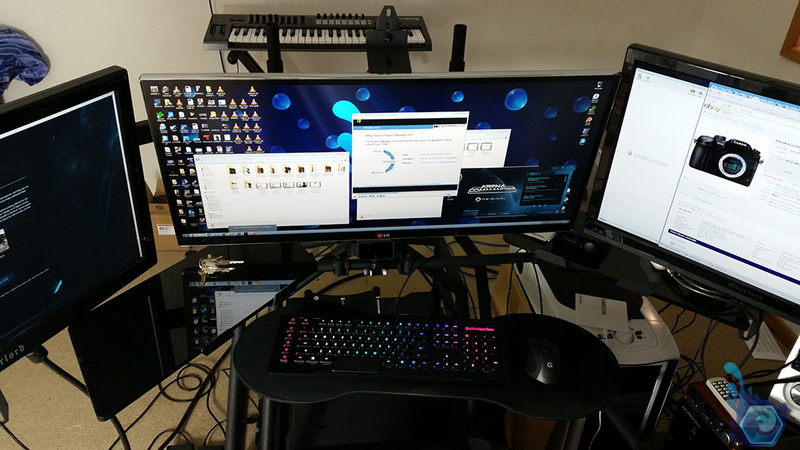 (You can’t use the 34UC97, the curved version – unless you have the VESA mount for it). 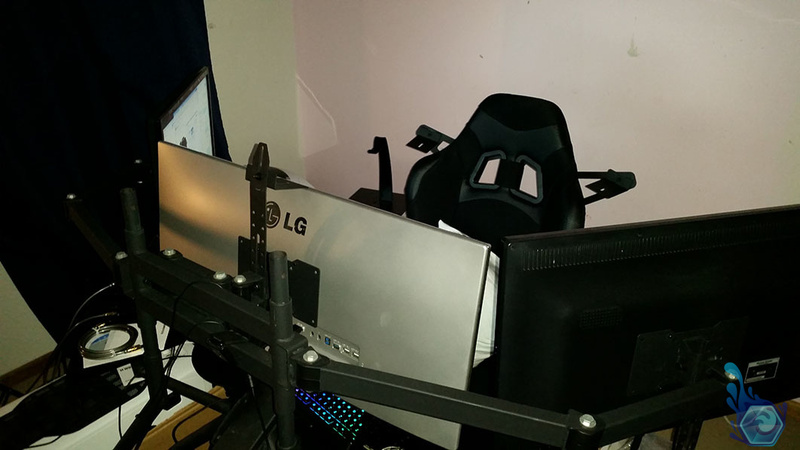 While setting up the monitor arms I wasn’t able to keep them very horizontal and they sagged a little especially the left arm which is a good inch lower then where it should have been. This was probably due to the fact that the instructions and video tutorials weren’t specific about if there were meant to be washers in the connection point between the arms and the main triple monitor mount. The gap was simply too big to leave out the washers and it was too small to have two washers between the arm contacts and it was a pain squeezing them in on the right arm which took a lot of effort especially lining up the hole to get the bolt through. The reason my revolution’s left arm is an inch lower is because I simply couldn’t get the second washer in on that side or even if it’s supposed to be there? There was also a slight gap the welders must have overlooked where the left arm connects to the main stand which was around a 3mm gap causing the end of the arm to be offset below the right monitor slightly. Fig16. 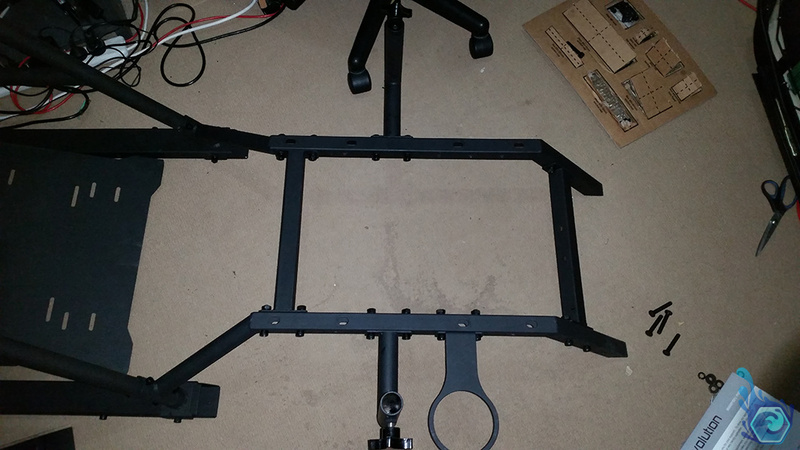 – A back view of the triple monitor arm mount. Fig17. 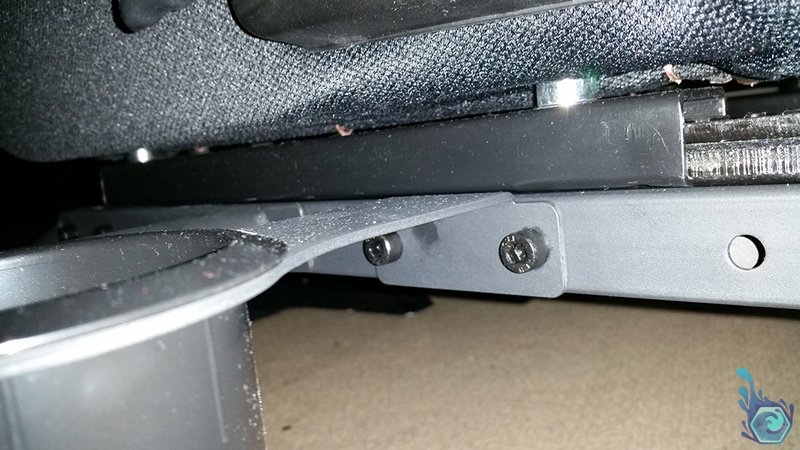 – A shot of under the chair where it mounts to the frame using a slide rail. Fig18. – After attaching the articulating arms. The seat is fairly comfortable with nice stitching and thick padding throughout and it really keeps your posture very straight. 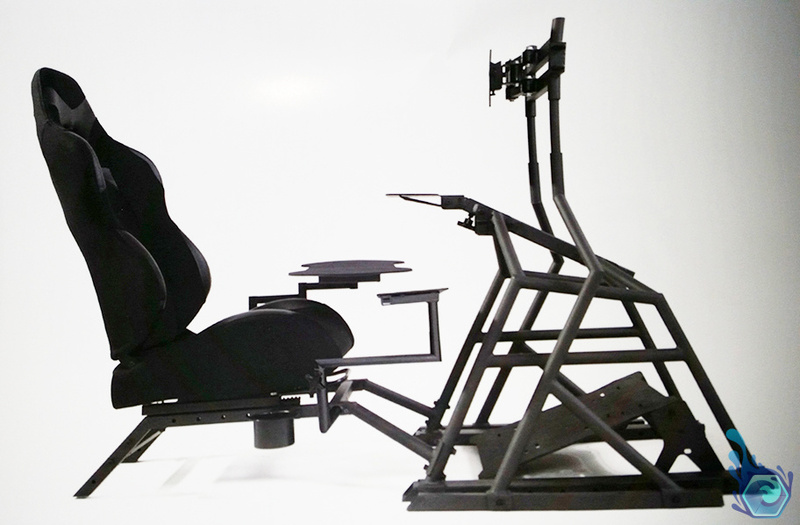 This chair would be ideal for a driving simulator because it’s, well… the actual chair you would find in a racer with the indented bolsters both above and below your arms. You feel snug when you climb into this contraption as, the seat hugs you and you’re surrounded on all sides by screens, truly a nerdgasm experience! 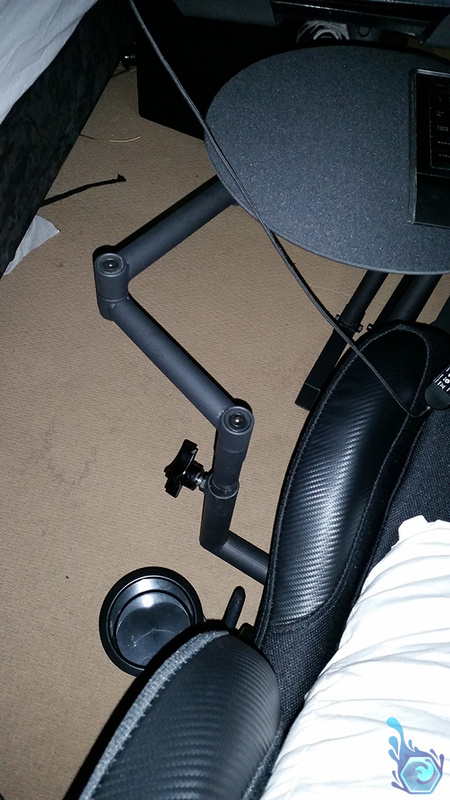 (Yes that’s the second YouTuber reference) However… I felt that this type of chair lacked something when gaming and general use mainly due to the fact that my arms kept bumping into the lower seat bolsters on the sides of the seat and I couldn’t rest them when not using the keyboard and mouse while watching movies. I would have absolutely loved to see two seat options for the Obutto, one with that racing seat and the other a flat back seat which are found in traditional cars. This would have been ideal as car seats are tailored for comfort and long periods sitting as well as not having the indents on each side thus letting you really put the seat back and use it as a bed as well if you’re interested in sleeping there. They could have even included movable arm rests which could be placed up or down if you feel like using them which are often attached to typical car seats. I’ll probably look for one of those seats that has a rail the same width as the Obutto and attempt to swap them out and see if it works with my Buttkicker. Fig19. – The point where the chair connects to the frame. Fig20. – A barebones chair frame. Fig21. 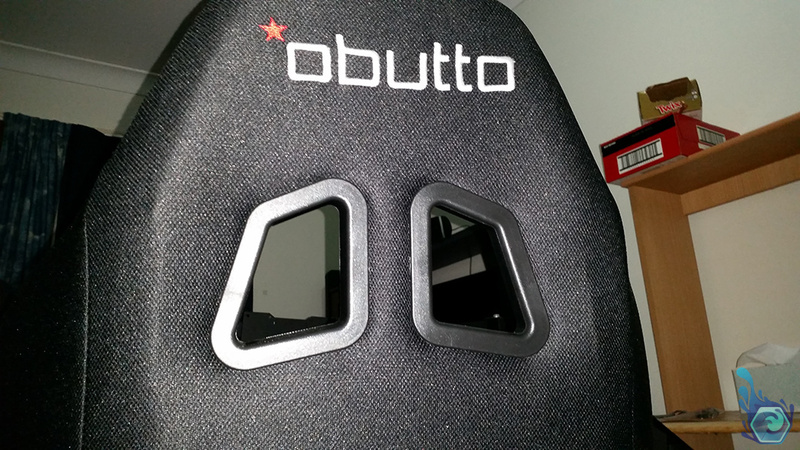 – The Obutto logo on the top outside of the chair, and also where you mount the additional speakers. Fig22. 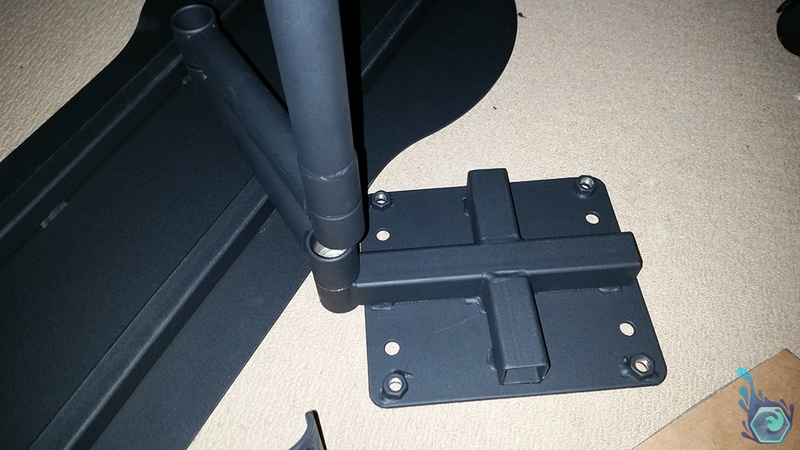 – The tabletop mount in position, this was tough to position as the metal was bent 1mm. Fig23. 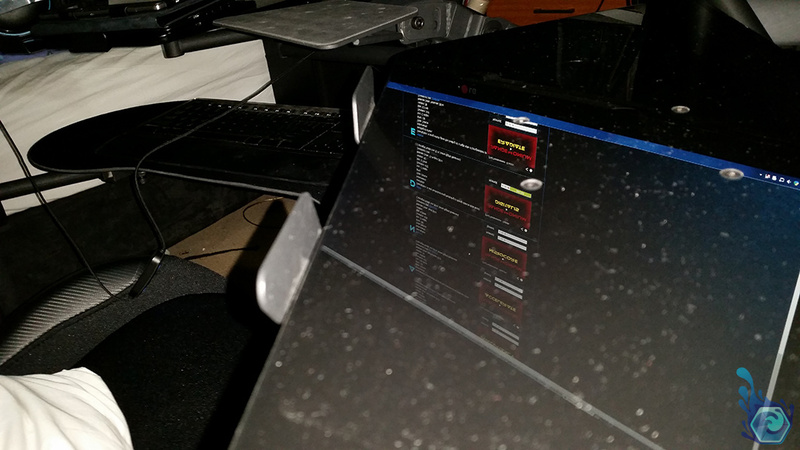 – A reflection of the screens in the transparent table tops, they get dusty fast. Fig24. 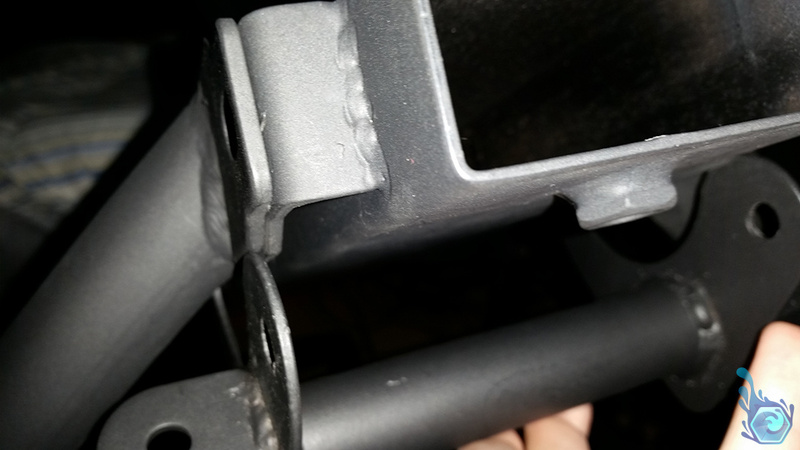 – A shot of why the table top mount wouldn’t go on easily, the metal was bent in 1-2mm. A very unique feature that I would say is a must-have on this setup are the acrylic tabletop add-ons which give you that little bit of desk space you need for any extra food, hard drives, papers or your phone which are all things that I often use them for. These pieces of acrylic on articulating arms don’t come that cheap however being priced at $150 AU but provide at least a little desk space – something you would be used to on a regular desk. 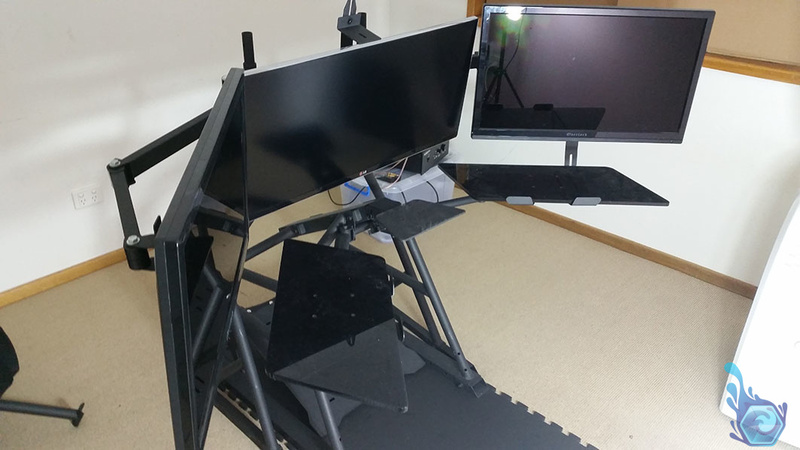 These arms don’t have to be used for desk space however as they’re specially drilled to VESA mount specifications to give you room for two more auxiliary screens on either side of your setup which would give you a total of 6 screens if you bought the triple monitor mount as well. I don’t know why you would need that many screens in your setup unless you’re a fan of radiation – or Fallout 3, but I’ve seen a couple of pictures where people use them for an aircraft instrument displays and they simply position the arms where the instruments are usually found inside the actual plane. Fig25. 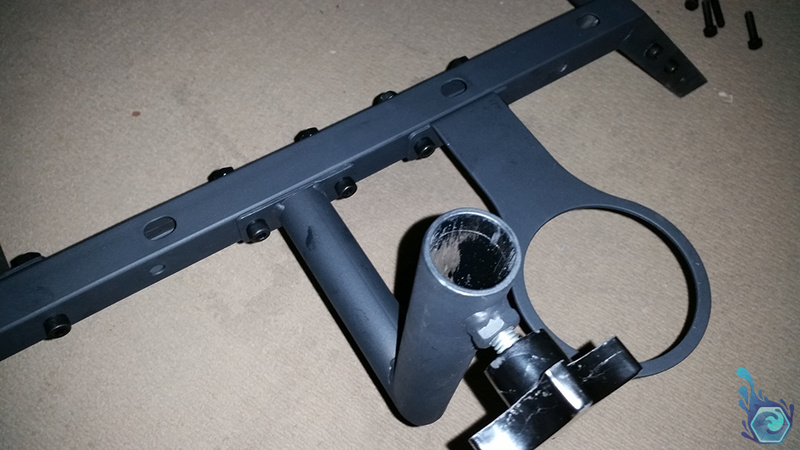 – The steering mount with holes for most wheels. Fig26. 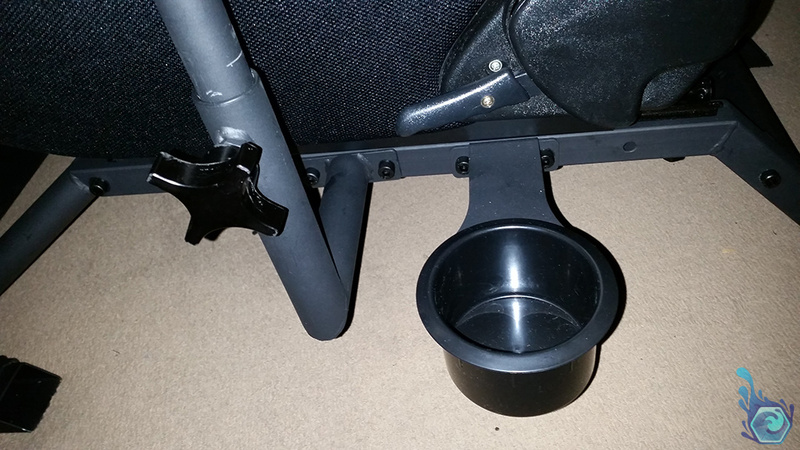 – The cupholder on the side of the chair mount. Fig27. 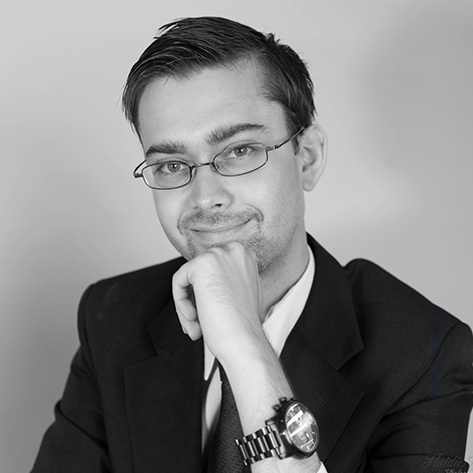 – The articulating keyboard arm. Fig28. – The footrest without the grip. The cupholders are a nice addition, I bought an extra one so I can have one on each side of the chair to choose between different drinks or to use for a key, phone and wallet holder or even a mini bin. The fact that you can easily remove the plastic is a bonus as well making it easy to wash them if the drinks leak. The only negative to these is that they rattle quite a lot if there’s nothing in them while using Buttkickers, this can be easily solved however with some rubber pads. Fig29. – A low angle of the mounted cupholder. Fig30. 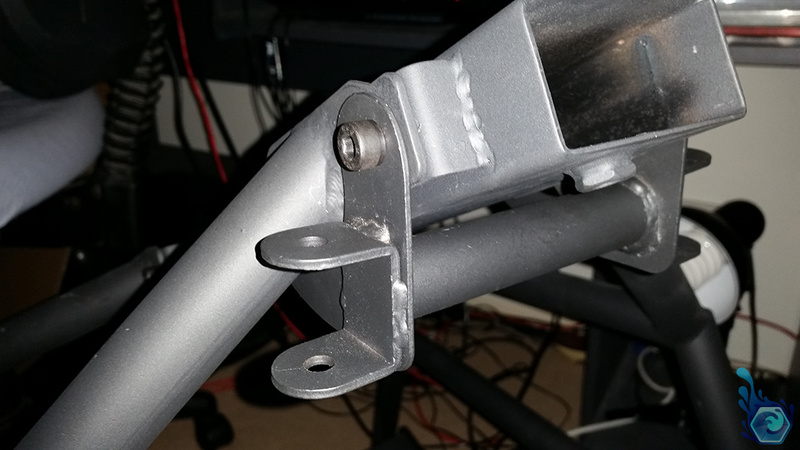 – The articulating keyboard arm set up. Fig31. 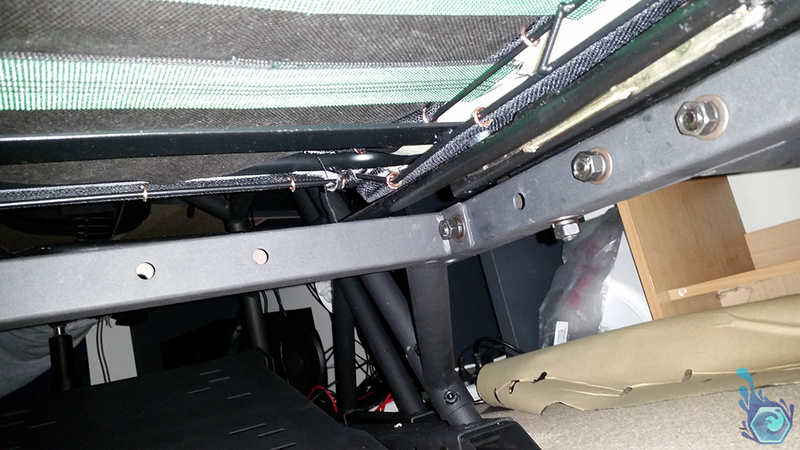 – The shifter mount. A change I would have liked to see to the main design was the possibility of mounting the chair 15-20cm’s higher up the main frame due to finding the angle I look at the screens to be too high and strains my head looking up at the monitors all the time with the chair in a fairly upright position. As I mentioned before looking down at the screens is my preferred style to reduce strain and to make it more realistic in racing games, Who looks up out the window in a real car – other than shorter people? You can lower the monitor height slightly but not enough to my standards where I would like to look down slightly to the screens, the adjustment is also limited by the height of the actual metal frame, if it’s too low the monitor hits the frame unless you move the whole thing backwards slightly which isn’t a solution as the monitors would be a little too far away for me. The really like the overall feel and design of the obutto although there are some changes I would like to see in future versions, especially to cater for more of the desktop gamer without such a focus on the racing side. Right now my feelings are mixed about the r3volution, i’m happy I bought it but I hope to see Obutto come out with a new version or design some modified parts that incorporate more of a desk oriented feeling to their products and fix the annoyances that I found in this cockpit. 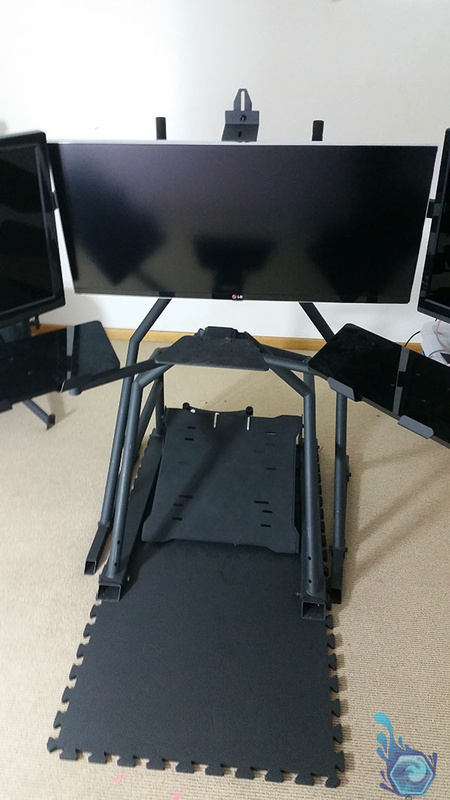 The three main changes I would like to see for a more desk-like version of the R3volution is the option for a different seat to a flatter just-as-comfortable one, the monitor stand to be sturdier and be optionally attachable at different points to the main chassis to prevent tipping and the seat height to be adjustable with more holes on the chassis and extend-able feet on the other end. Fig32. 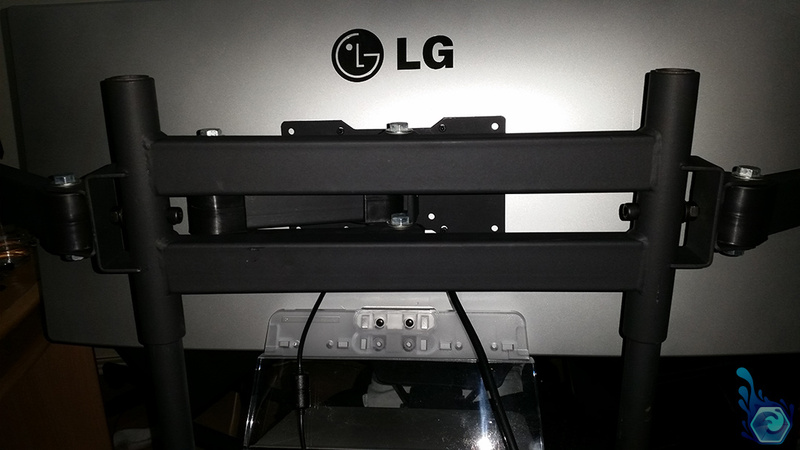 – The lower half of the r3volution. In the end I love my r3volution, the amount of work I do is increased a little with the cockpit even though it does take a few seconds to hop in and out this contraption. It also takes up almost an entire room with the monitor arms outstretched and has a quaint feel like a transformer robot in disguise. 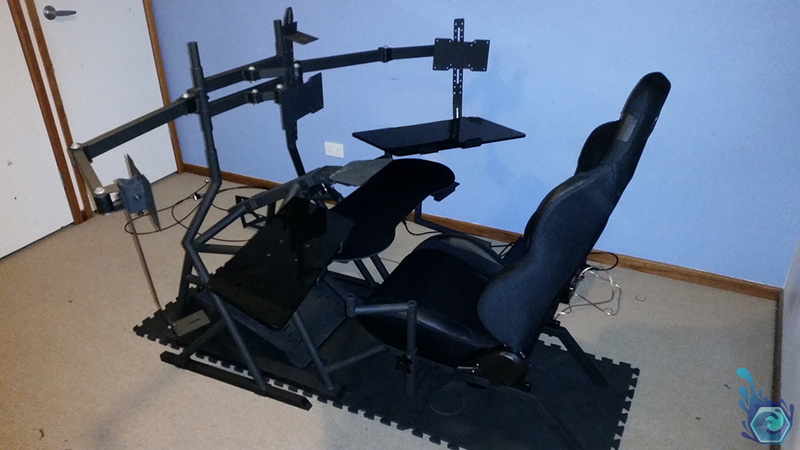 Your posture will be excellent – no more slouching in those typical leather desk chairs and the immersion you get from racing games is literally the most fabulous part of this cockpit, you feel like you’re in the race especially with buttkickers. Fig33. – A back view of the Obutto in use. Fig34. – A side view of the unit set up. Not a bad deal of $999 for the base station and then you can add on extras as you like. Amazing durability and the metal looks stunning and is packaged considerably well. Very sturdy device. This thing is huge especially with the monitor arms out, but surprisingly actually saves space compared to a normal desk. It also weighs 100kg’s and is hard to move. There are a lot of nice features in this desk as well as additions you can purchase for a little more. Comes with a cupholder! A beautiful gaming cockpit with a space age look but lacks cable management routes leaving them messy. It will surely be the talking point of the room. A very early adopter to a change in desk seating, a very nice idea that just needs some refining. This is an elegant piece of furniture that lets you relax in your very own command center and game with more immersion then you thought you ever needed. Your drinks are one gesture away and there’s room for 6 screens if you like radiation. 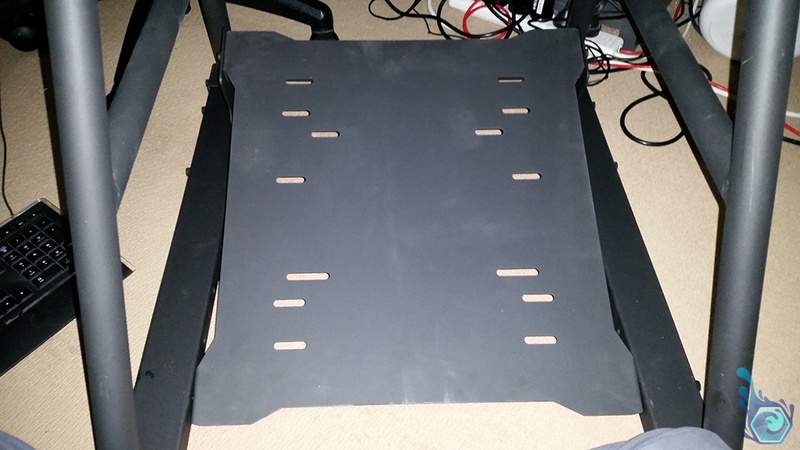 The monitor stand needs to be a little more secure and some more chair height adjustment would be ideal. 76% – 90% = Fantastic Item, An item that you need but may either cost lots or wear out over time and may eventually need replacing after 2 or so years. Tagged Desk, Gaming Cockpit, Obutto, Obutto Revolution, R3volution. Bookmark the permalink. Great review thanks for the information! How much did you pay, shipped to Aus ? Hello, it was $50 delivery for the 95kg packages in total. I’m just bought the R3volution and am just bow learning of Buttkickers. What setup for them is recommended? Is the “Simulation Kit” they have fine or should invest more? Hey, well the simulation kit is a little weaker then the LFE kit, but mine are ridiculously shaky, I only use about 35% of their full power, so yeah I can recommend the simulation kit.